In 1875 Johann Simon took over the Köbel’sche estate on Laufer market square, which was equipped with brewing rights and butchery and Branntweingerechtigkeit. He focused on brewing beer, which had a long tradition at this point through the typical communal tradition in Lauf. In the following years, his son Georg and his grandson Karl Simon successfully continued the business. In 1930, the growing brewery was relocated from the cramped estate on the market square to the Urlas in Heroldstrasse. It was brewed until 1957, when a brewhouse was built, in one of Laufer Kommunbrauhäuser. The artisan brewing of a private brewery was always in the foreground then and the Simon beer specialties found many friends. 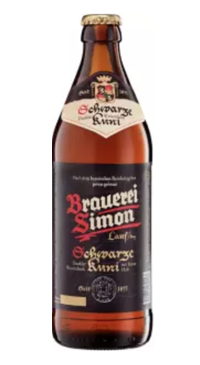 True to the motto “quality over quantity”, the “Simon Weissbier” and the “Simon Spezial” and the “Simon Hell” brew only 3 types of beer all year round, as well as the “Schwarze Kuni” , a dark, strong wheat buck in the winter season . Whichever beer you drink, Simon Bier stands for traditional Franconian beer culture from the Nuremberg region. Dunkel is one of Europes oldest styles of beer – before pale lagers burst on the scene in the 1800’s, Dunkel and Dunkel style beer was king in the German empire. These are impeccably smooth, well made beers. With toasty chocolaty notes coming from excellent malt usage and just enough spicy hop to balance everything out. These dark lagers will impress beer nerds to beer novices alike – they are also fantastic for food paring, think hearty pub fare!